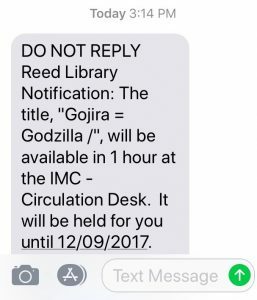 Did you know the library system can send you text notifications for things like holds and due dates? You can sign up here (standard text messaging rates apply). We are pleased to offer a trial of The Stationers’ Company Archive, an enlightening resource for understanding the workings of the early book trade, the printing and publishing community, the establishment of legal requirements for copyright provisions and the history of bookbinding. Explore extremely rare documents dating from 1554 to the 21st century in this resource of research material for historians and literary scholars. Please note that PDF downloads are not available during the trial. Our trial is available through November 8th. Please send questions and trial feedback to Erin Gallagher, Director of Collection Services.